Just recently, American citizens have enjoyed Thanksgiving Day, which would traditionally mark the start of the holiday season in the United States that will continue to Christmas to end with the traditional New Year celebration. Originally, Thanksgiving was a way of expressing gratitude and appreciation to friends, family and God himself for one’s well-being. This holiday takes its lineage back to the early days of American history, to the very moment when first immigrants from England arrived in 1620 aboard the now legendary ship Mayflower to the shores of present-day Massachusetts. Most of those pioneers were only able to survive the harsh first winter on the alien continent due to the assistance of Indians, especially those from the Squanto tribe. If you donate $1.90 a homeless person will have a nice lunch to keep him warm. Through donating 19 dollars, you will get a total of 10 people fed. During that time of the year, even American politicians would try to look kind and generous in the eyes of the public. Consecutive American presidents would demonstrate their commitment to the spirit of Thanksgiving by symbolically pardoning the turkey. However, back in 1989, President George W. Bush, on this occasion would cynically state that there was no actual “pardoning,” as the turkey can only expect a “postponement of the sentence,” adding that it made little difference for the turkey itself as long as it didn’t end up on the president’s holiday table. However, like most of the actions of the Trump administration we’ve witnessed over recent years, this gesture would only highlight the duplicity of Washington’s position on the eve of Thanksgiving Day celebration. And this duplicity couldn’t become any more clear and obvious when one take a look at Syria, where innocent civilians keep losing their lives under American bombs, including those that were dropped on the eve of Thanksgiving Day. As SANA would report, twenty civilians including 9 children and 8 women perished in an air strike committed by the US-led international coalition against a market in the al-Souk area in Hajin city of the Deir ez-Zor Governorate on November 24. A day earlier, warplanes of the same coalition carried out violent raids against al-Sha’afa village of the Deir ez-Zor Governorate southeastern countryside murdering 11 civilians and leaving scores more injured, on top of inflicting massive damage to local housing. SANA would earlier report that 40 civilians, mostly women and children, were martyred in a bombing run of the US-led international coalition on al-Buqa’an village in the surroundings of Hajin town on November 17, only a couple of days after a similar attack that Washington launched in this area with the use of cluster bombs. Yet another report would state that at least 60 civilians were murdered or injured in a massacre carried out by American aircraft in al-Sha’afa village of the Deir ez-Zor Governorate. If one is to add up all those report this will bring us to a total of 160 civilians murdered in the course of Washington’s air strikes in Syria in the month of November. Disturbingly, a comparable number of civilian casualties would be reported back in October 2018. At this point, the US-led coalition has become pretty methodical in using white phosphorous munitions in Deir ez-Zor, leaving behind hundreds hundreds of dead and wounded in spite of the fact that the Geneva Convention of 1977 outlawed anyone’s desire to deploy those in residential areas. However, back when it was signed the United States and Israel refused to sign an additional protocol of this convention and now Washington refuses to recognize that it has been using phosphorous munitions in Syria. The Syrian Foreign Ministry has repeatedly submitted reports to the UN to express its outrage over civilians deaths in the course of the US-led air strikes, including those that were committed with the use of white phosphorus bombs, but has so far received no condemnation of the criminal nature of Washington’s actions. In connection with the recent celebration of Thanksgiving in the United States, it will only be appropriate to recall the catastrophic situation in Rukban refugee camp. 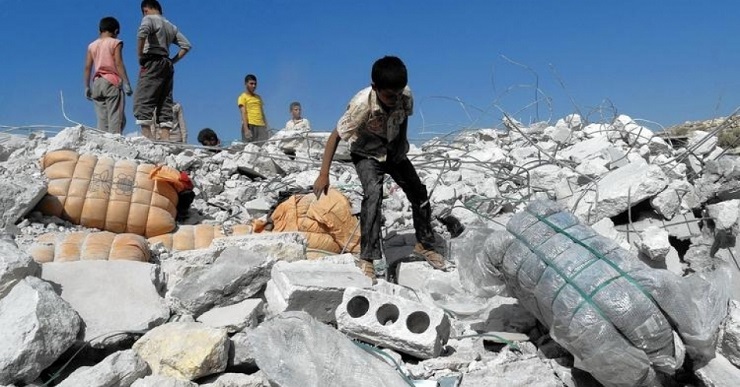 This situation has been brought to the attention of UN representatives, in particular, the United Nations resident coordinator in Syria, Ali al-Zaatari, but no action has been taken to this day. This camp is located in the immediate vicinity of the illegal American base of Al-Tanf is situated in the area controlled by Washington, however the US refuses to recognize its direct responsibility for the situation in the Rukban. However, reports show that we’re witnessing nothing short of a humanitarian catastrophe unraveling there. Both human rights experts and local witnesses claim that living conditions of those occupying Rukban refugee camp can be compared to those prisoners of war encountered in German concentration camp. However, those refugees received nothing to remedy their suffering on from Washington on Thanksgiving Day, let alone any other day of the month. If it weren’t for the Russian military police that ensured the security of a UN humanitarian convoy that reached this camp in early November, it’s quite possibly people would start dying from starvation there. To one’s disappointment, while going through recent reports from Syria one cannot come across those showing that Washington has had any desire to show goodwill and mercy in recent months. In the very least, the US could start rebuilding the city of Al-Raqqah that it leveled with the ground in the course of the so-called liberation. However, we’re only witnessing Russian, Iranian and Turkish servicemen rebuilding and demining those Syrian cities affected by the war, putting them back in order. In the center of the city of Daraa has recently witnessed a massive reconstruction effort mounted by the Russian side, but instead of thanking Moscow, Washington chose to slap it with a new round of sanctions for helping Syria. And it doesn’t get any better, especially in the light of the recent report of the office of the inspector general of the Department of State, a significant part of the 700 million dollars that the US allocated on providing humanitarian relief to the people of Syria and Iraq could have fallen into the hands of terrorists due to repeated cases of mismanagement of the USAID. Maybe this fact be considered to be a sign of Washington compassion on the eve of Thanksgiving? And that it is sure that nobody is going to thank Washington for the fact that those territories that fell under Washington’s control are now retaken by radical militants that Damascus has been fighting for years. Yet, it’s clear that Donald Trump could have easily found more mercy deep down in his hear that he showed by pardoning a turkey on the eve of Thanksgiving Day.